These days, there is no new world. The maps have long since settled and stayed put. People know the shapes of Africa, Asia, and South America. And they know which beasts were mythical and which aren't. Manatees are real, mermaids aren't. Rhinoceroses exist and sea monsters don't. There are no more sea serpents guarding deadly whirlpools. There are pirates, yes, but there is nothing romantic about them. The rest is all stories, and stories have been put in their place. But now I felt the need to stay close to Tiger Lily. I don't know if I thought I could protect her or if I just needed to see how it would end for her. But somehow it felt important be there. Faeries can be unfailingly loyal, even, apparently, to someone who doesn't seem to notice them. And I felt loyal to the girl with the crow feather in her hair. From above, the world looks orderly. That is one of the primary benefits to having wings. Being high shapes everything below into peaceful patterns. And even though you know there is chaos below, messiness everywhere, it is reassuring to sometimes think that it all eventually sorts itself out into something that looks elegant. Being the lover of retellings and Peter Pan that I am, when I first heard of Tiger Lily (and the rave reviews it was getting) I knew I had to read the version of events. Unfortunately, Tiger Lily and I did not mesh well. What started off as a wonderful story, I absolutely fell in love with the first two pages, went quickly down hill. Tiger Lily lives in a village where she was adopted by their shaman, Tik Tok, and she is character where something is different about her. She's not like the other girls. Tink, our narrator, thinks the same and secretly follows Tiger Lily on her adventures. Eventually Tiger Lily encounters Peter Pan, whom Tink and Tiger Lily fall in love with, and his group of Lost Boys. I wasn't a fan of Tink being the narrator. For me, it took away from the story. I didn't see any character development from anybody - maybe a smidge from Tiger Lily and her friend Pine Sap - but that's it. Her narration felt too much like observing, which is was, instead of being inserted into the story. Like, people watching only the people are boring. 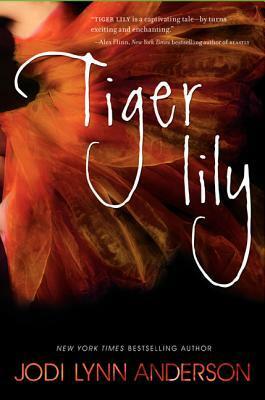 While I appreciate Jodi's new take on an old favorite, I was bored by Tiger Lily. I do think Jodi turned the story into her own creation, and there are nods to the original story, but I didn't find myself involved or even interested in the story of the characters. With a 3.97 Goodreads rating, I'm clearly in the minority, but I felt such a disconnect with this story and its characters. The writing is beautiful and I can see how others fall in love with this story, but I just was not one of them. However, I do think Jodi ended the story very well as it felt fitting and realistic to both the story and characters.